Published: Dec. 23, 2018 at 03:02 p.m.
Carolina Panthers tight end Chris Manhertz gets a 50-yard touchdown catch from running back Christian McCaffrey against the New Orleans Saints. Published: Dec. 9, 2018 at 01:58 p.m.
Carolina Panthers running back Christian McCaffrey rushes for a 1-yard touchdown. 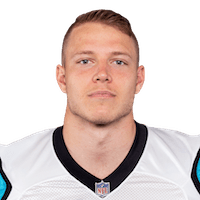 Published: Dec. 9, 2018 at 01:20 p.m.
Carolina Panthers running back Christian McCaffrey rushes for a 4-yard touchdown. Published: Dec. 2, 2018 at 01:34 p.m.
Carolina Panthers quarterback Cam Newton slings a pass to running back Christian McCaffrey in the flat for an 8-yard touchdown.